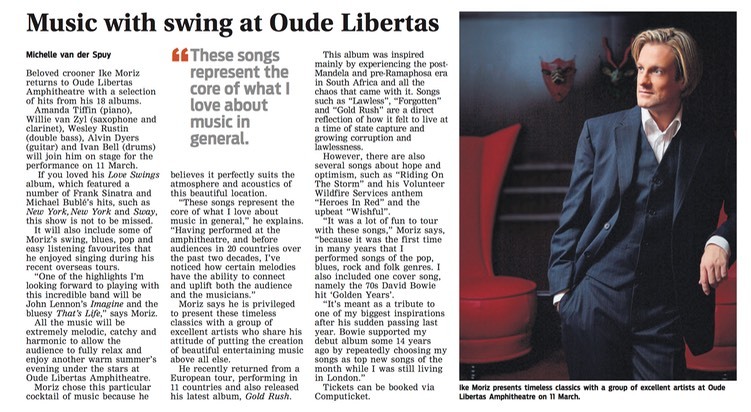 Eikestad Nuus, page 12, by Michelle van der Spuy, Stellenbosch, SA, 08.03.18: “Music with swing at Oude Libertas” (photo: Antonia Steyn) Ike Moriz presents timeless classics with a group of excellent artists at Oude Libertas Amphitheatre on 11 March. Beloved crooner Ike Moriz returns to Oude Libertas Amphitheatre with a selection of hits from his 18 albums. Andrew Ford (piano), Willie van Zyl (saxophone and clarinet), Wesley Rustin (double bass), Alvin Dyers (guitar) and Ivan Bell (drums) will join him on stage for the performance on 11 March. If you loved his Love Swings album, which featured a number of Frank Sinatra and Michael Bublé’s hits, such as New York, New York and Sway, this show is not to be missed. It will also include some of Moriz’s swing, blues, pop and easy listening favourites that he enjoyed singing during his recent overseas tours. “One of the highlights I’m looking forward to playing with this incredible band will be John Lennon’s Imagine and the bluesy That’s Life,” says Moriz. All the music will be extremely melodic, catchy and harmonic to allow the audience to fully relax and enjoy another warm summer’s evening under the stars at Oude Libertas Amphitheatre. Moriz says he is privileged to present these timeless classics with a group of excellent artists who share his attitude of putting the creation of beautiful entertaining music above all else. He recently returned from a European tour, performing in 11 countries and also released his latest album, Gold Rush. This album was inspired mainly by experiencing the post- Mandela and pre-Ramaphosa era in South Africa and all the chaos that came with it. Songs such as “Lawless”, “Forgotten” and “Gold Rush” are a direct reflection of how it felt to live at a time of state capture and growing corruption and lawlessness. However, there are also several songs about hope and optimism, such as “Riding On The Storm” and his Volunteer Wildfire Services anthem “Heroes In Red” and the upbeat “Wishful”. “It was a lot of fun to tour with these songs,” Moriz says, “because it was the first time in many years that I performed songs of the pop, blues, rock and folk genres. I also included one cover song, namely the 70s David Bowie hit ‘Golden Years’. Tickets can be booked via Computicket.